A pop-up café that aimed to challenge the negative stigma around dementia and spread the word on innovative arts-based research appeared in Nottingham recently. 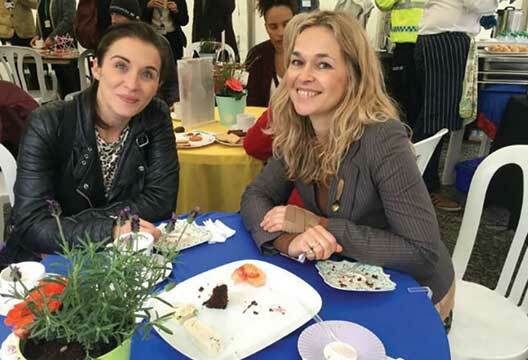 As well as attracting This Is England actress Vicky McClure the café displayed artwork by those with dementia and gave visitors the chance to sample a ‘dementia-friendly afternoon tea’. The Imagination Café, as it was called, was created by head of dementia care Professor Victoria Tischler (University of West London) in partnership with the Nottingham Contemporary gallery, an art space that has supported dementia research since it opened. As well as providing information about dementia itself courtesy of Dementia UK and the Alzheimer’s Society, and new research in the field, the café offered activities specially designed for those with dementia, including visual art, music, storytelling, drama and yoga – underpinned by the research of Tischler and her colleagues. The project also included posters displayed at bus stops in Nottingham that featured art made by research participants from the Dementia and Imagination project and a call to action to #UniteAgainstDementia. Students from the Alzheimer’s Society’s Arts and Dementia Doctoral Training Centre, the Dementia Arts and Wellbeing network, and the Centre for Dementia (University of Nottingham) were also involved, along with volunteers who are living with dementia and their carers. Tischler said she hopes to take the café to Llandudno in North Wales, Edinburgh and London, working alongside collaborators in each place to give the event a bespoke feel. She will also be appearing for The Psychologist at this year’s Latitude Festival alongside BPS Vice President Professor Peter Kinderman (University of Liverpool) and consultant psychiatrist Dr Henrietta Bowden-Jones, in conversation around ‘a manifesto for psychological health and wellbeing’.